The ornate silver cup based on the Ardagh Chalice is one of the most coveted trophies in Irish sport and underlines the appeal and reach of the GAA across Ireland. ‘Sam’s’ shining glint never fails to command attention, turning heads everywhere it goes, provoking interest and curiosity, and em­bellishing every occasion it graces. Yet, very few Irish people know its history. A new book by Kieran Connolly, Sam Maguire: the Man and the Cup, tells the story behind the cup. With a foreword by Aogán Ó Fearghail, President of the GAA, it describes Maguire’s role in the GAA. The final chapters describe the most notable All-Ireland football finals and interesting facts and figures. Sam Maguire’s life began in Dunmanway, as Ireland commenced the final fight for independence. He played a major role in Ireland’s fight for independence, taking a senior role in the IRA in London where he was the main agent of Michael Collins, as well as playing an important part in encouraging the development of the GAA. He died penniless from TB in 1927. His friends recognised his significant contribution to the GAA and decided to give a cup to the GAA to perpetuate his memory: the Sam Maguire Cup. Sam Maguire: the Man and the Cup recounts, the origins of the design of the cup and the story of its creation. 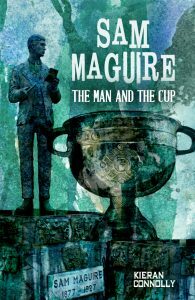 Published by Mercier Press, Sam Maguire, the Man and the Cup, will be available nationwide from 6 September 2017. RRP €12.99.